I foolishly placed a dinner plate on the gas stove burner, only for a moment to warm it up. I forgot the burner was on and the plate broke in half. It is one of a very special set purchased while on vacation, Made by HD Designs. I feel horrible about losing any part of the set. I did find a website, replacements.com and they actually have a listing for the plate, its out of stock, discontinued in 2010. Although they do provide a locater service, so maybe they can find me replacements. 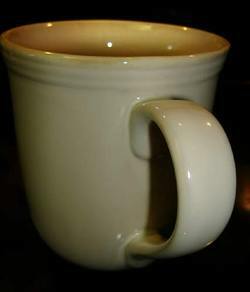 For your perfect mug to put that special cup of java inside you can visit the online store of Peacock Gourmet Coffee & Exotic Teas. Your site is outstanding but your cup predicament had me just chuckling. I've got the same issue. 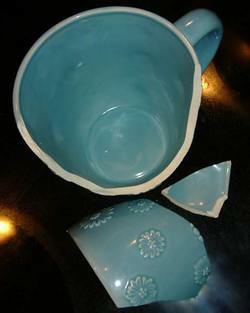 Invariably I find one cup that I absolutely adore and it falls off of something. Whether it's an expensive sunrise cup or an ordinary cup, Decaffeinated Tea or Decaffeinated Coffee, the cup is only as good as what you put in it. 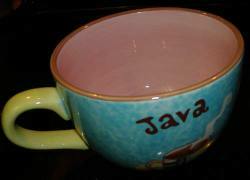 i like the blue java cup. year where did you buy it? Who knows where can I download desktop virtual girls from here - VirtuagirlHD for free?? Is it possible? I've heard it is. I am also very meticulous with my coffee cups.I really feel that drinking coffee is more enjoyable, fun and inviting if you are drinking from a nice cup.i sure like your new cup. no wonder you're proud to have it.. I really know that you did challenging job, completing your good enough information related to this topic. Thence, that kind of work people perform completing the dissertation writing or just mini dissertation investigating. Nothing like a robust cup to get you going. I like the huge wake up with AL on the Weather Channel. I got it at Fred Meyer (Kroger) a few years ago and can't find any like it anywhere!!!!! 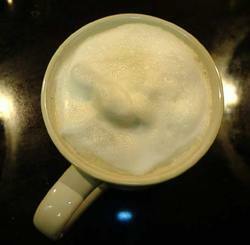 I really like this new coffee - Mission Grounds Gourmet Coffee. My cousin gave me some and its terrific. They help homeless children in Atlanta with the proceeds. I agree that "HD" Designs makes the perfect Coffee cup. I just bought one this weekend. I also bought a "HD" Designs "pasta plate" for $4.95 and then found it on Ebay for $17.95+shipping. I've just come to this blog and must say i'm having a great time reading the posts.This definitely merits a bookmark! I just read your blog.... every single post (sorry not all the comments) and throughly enjoyed it! Keep it up. Coffee lovers unite! Oops, I thought http://muglamania.com/index.html was US. I have always planned to buy more of them. I bought my Nevis in Oxford and my husband bought the Suffolk for me at a mall coffee shop. I think they turn up in random places over on this side of the water. Good luck with your search. i too am looking for an hd designs website. if you find one please let me know. and i will do the same. Thanks my-mia-mie! I went in search of Dunoon today. Great designs!! I can't seem to find a U.S. distributor for them, but I'm not done searching yet. De-lurking! I look for the SAME thing in mugs! I hate, loathe, despise and abominate thick rims. My favorite mug brand is from the UK, Dunoon. They are microwave and dishwasher safe. Google them and you will find so many shapes, sizes and patterns that your head will spin. I have a HUGE "Nevis" and a dainty "Suffolk," both with thin rims. I think you would like them. Hey Steph! Thanks, it's good to be back. D, my favorite blogdaddy, how the heck are ya? No, I didn't try epoxy, because a big chunk of the cup appears to have disappeared. I'm starting to wonder if maybe the dog ate it. Jana, I don't mind you asking at all. I found both cups at my local Fry's. It's kinda like a Target superstore, with furniture and china and appliances as well as groceries and stuff. Huge. I wonder now if the HD Designs folx only sell wholesale to big chains like Frys, because I cannot find ANYTHING about them online. It's very frustrating. Welcome back! I've missed your blogging! And I am so sad for your cup loss! Big sigh. Nice, Christine! I have a big "first cuppa the morning" brew cup (white, has a pattern that makes it look like a small basket) that is similar in size-shape to your new cup. Who can live w/o that BIG a.m. cup? Or would want to? Also makes a nice, quirky cup that perfectly holds one 12-oz bottle of beer. *heh* But that's not a morning brew for me. On the broken cup: did you try a 2-part epoxy like JB Weld? I've used the stuff for everything from fav coffee mugs to engine blocks (engine blocks?!? Yes) with success. In fact I have a "Broken Promise Keepers Mug" (the perfect metaphor for the organization, IMO--and I thought so when I recieved the mug :-)) that is one of my son's favs. Been going 10 years, now, on the same JB Weld repairs. Holding up to microwave, coffee--whatever he's thrown at it. Of course, it's just the handle and a large chip out of the rim I had to repair on it.